To understand each tribes one has to begin with here. This tribe gave England its name. (SURPRISINGLY IT IS ROOT IN SOUTH INDIAN WORD Anegundi..Capital of Kishkindha kingdom. ( ..THE LAND OF VENKTESWARA) The ancestor of the Swedish royal house of the Ynglinga were also been called the “Inglings” or sons of Ing. ..(Angada) Yungvi or Ingwas was progenitor of all anglican kings. Ramayana says History of Hanuman ,sugriv and Vali? what happened Afterwards? Ingvaones migrated Alongwith Istvaones (Ikshvakuvanshis) in Europe. Anglican branch keep history of crown of Kishmjndha. Link to Yinglinga saga will say you further story of Angadvanshis. Record of Ancient History of Bharatvarsha(India)helps us to undestand the similarity between Manu of Ayodhya and sons of Mannus dwelling in Europe. We can find out the roots of “O’vaeites” in the “Avesthya” of Ayodhya , Avasthya who came form Amaravati . 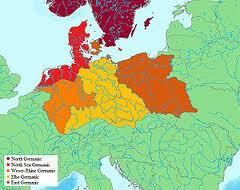 Similarly , the Ancient history of India also help us to understand Germanic tribe Ingvaeones too. J.P.MITTAL mentions in his book “History of Ancient India: From 7300 BC to 4250 BC “ that…..
Recrod of acient Bharatvarsha also prompts us to think that Agni ,the friend of Manu was also rescued from great flood. Indra , VAIVASWATA MANU ,AVASTHYA as well as AGNI all were rescued from floods. They had knowledge of pre -flood vedic period culture. They all existed before satyuga”. When Manu was founding Manu..Amarawati already existed. Indra of Amarawati supported Manu to found Ayodhya. Pliny ca 80 CE in his Natural History (IV.99) lists the Ingvaeones as one of the five Germanic confederations, the others being the Vandili, the Istvaeones, the Hermiones and another group he does not name. According to him, the Ingvaeones were made up of Cimbri, Teutons (nOW WE KNOW THAT HAS COONECTION WITH TUTICORIN), and Chausi. Stripped of its Latin ending, the Ingvaeon are the Ingwine, “friends of Ing” familiar from Beowulf, where Hrothgar is “Lord of the Ingwine”—whether one of them or lord over them being ambiguous. At other end “ Teutonic mythology, Volume 1” by Jacob Grimm explains us that…..
From works by both Pliny and Tacitus we know that we have a West Germanic cultural group (or a confederation of tribes) called the Ingaevones and we know they were worshippers of Ing/Yngvi (who most scholars and practitioners believe is an aspect of Freyr). We see the god Ing Frey specifically mentioned in both the Lokasenna and Olafs saga. As per Indian History…Anegundi is towm of ancient kingdom of Kishkindha…Ramayana narrates Kishkindha kanda. while Grimm explains that Freyr had another name Yngvi or Yngvifreyr , and the whole race of Ynglingar were named after him. Fraujaz or *Frauwaz (Old High German frô for earlier frôjo, frouwo, Old Saxon frao, fr?io, Gothic frauja, Old English fr?a, Old Norse freyr), feminine *Frawj? (OHG frouwâ, later also frû, Old Saxon fr?a, Goth. *fraujô, Old Norse freyja) is a Common Germanic honorific meaning “lord”, “lady”, especially of deities. *Fraujaz or *Frauwaz (Old High German frô for earlier frôjo, frouwo, Old Saxon frao, fr?io, Gothic frauja, Old English fr?a, Old Norse freyr), feminine *Frawj? (OHG frouwâ, later also frû, Old Saxon fr?a, Goth. *fraujô, Old Norse freyja) is a Common Germanic honorific meaning “lord”, “lady”, especially of deities. The epithet came to be taken as the proper name of two separate deities in Norse mythology, Freyr and Freyja. In both Old Norse and Old High German the female epithet became a female honorofic “lady”, in German Frau further weakened to the standard address “Mrs.” and further to the normal word for “woman”, replacing earlier wîp (English wife) and qinô (English queen) “woman”. Just like Norse Freyja is usually interpreted as a hypostasis of Frijj? 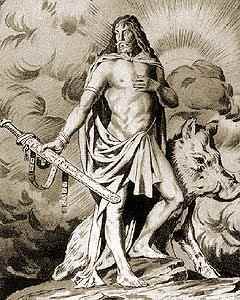 (Frigg), Norse Freyr is associated with Ingwaz (Yngvi) based on the Ynglingasaga which names Yngvi-Freyr as the ancestor of the kings of Sweden, which as Common Germanic *Ingwia-fraujaz would have designated the “lord of the Ingvaeones. Both Freyr and Freyja are represented zoomorphically by the pig: Freyr has Gullinbursti (“golden bristles”) while Freyjahas Hildisvini (“battle-pig”), and one of Freyja’s many names is Syr, i.e. “sow”. Will anybody go deeper and try to find out similarity between “ Freyr “ and persian traditional name Firoz? We have to recall the fact that Capisa (A kingdom in Afghanistan) and Persia were friendly kingdoms . Both the kingdoms were following the tradition of ttwo nation theory. In the coming chapter about “Capisa” we shall look at detail about the coins of the Capisa kingdom . Coin details says us that On the reverse side of coin there is divinity with flames , with a Pahalavi inscription , copied after the coins of sasanian king KHUSRAW SECOND ( 591 -681).Coins of Capisa also suggest that both countries existed with principal of two nation theory..
During pre-chritianity or pagan period . History of Europe says that people of Luthiania were fire worshipers. They also worship Perkunas (Indra). CONCLUSION: Ingviouns were Angelcynn who carry crown of ancient kingdom of Kishkindha. and migrated to europe alongwith sons of Manus…Seshanchalam..Saxons. An Ingui is also listed in the Anglo-Saxon royal house of Bernicia and was probably once seen as the progenitor of all Anglian kings.Since the Ingaevones form the bulk of the Anglo-Saxon settlement in Britain, they were speculated by Noah Webster to have given England its name, and Grigsby remarks that on the continent “they formed part of the confederacy known as the ‘friends of Ing’ and in the new lands they migrated to in the 5th and 6th centuries. In time they would name these lands Angle-land, and it is tempting to speculate that the word Angle was derived from, or thought of as a pun on, the name of Ing. Ing, the legendary father of the Ingaevones/Ingvaeones derives his name from a posited proto-Germanic Ingwas, signifying “man” and “son of”, as Ing, Ingo, or Inguio, son of Mannus. This is also the name applied to the Viking era deity Freyr, known in Sweden as Yngvi-Freyr and mentioned as Yngvi-Freyr in Snorri Sturluson’s Ynglinga Saga..
Modern Angeln, also known as Anglia (German: Angeln, Danish: Angel, Latin: Anglia), is a small peninsula (within the larger Jutland peninsula) in southern Schleswig in the northern Schleswig – Holestein, Germany, protruding into the Bay of Kiel. Angeln has a significance far beyond its current small area and country terrain, in that it is believed to have been the original home of the Angels, Germanic immigrants to Central and northern England, and East Anglia. This migration led to their new homeland being named after them, from which the name “England” derives. Both England and the English language thus ultimately derive their names from the Angles and Angeln. Angeln in Germany was place of Angels or Anglo. They migrated to Britain and Gace its name England. The Angles were part of the Federation of the Ingaevones, with their mythical ancestor and God of Fertility Yungvi, and both terms might well share the same root (inglish – anglish), say as the origin of the federation. Pokorny points out the possible use of this etymological root in other ancient names, such as Hardanger and Angrivarii . Angels , together with Saxons and Jutes, left their home to migrate to Britain in the 5th-6th centuries. For the years 449-455, the Anglo –Saxon Chronicle, written c. 890, describes how King Vortigern (a British tribal king) invited the Angles to come and receive land in return for helping him defend against marauding Picts. Those successful Angles sent word back that good land was available and that the British were worthless (presumably as soldiers). A wholesale emigration of Angles and kindred German peoples followed. The tribe belong to Amarawati . I think this gorup belong to Amorite tribes ,who developed Mesepotamia , Sumerian and Babylon sulture. The same tribe also developed Israel and Egypt. Amuru Muru means “Amar” and “Amrit” and Holy grail is in the centre of this tribe. All the evidences says that these are tribes of Indra of Amarawati.Sanatan Hindu history syas that Indra of Amarawati helped 14 Manu to found “Ayodhya” in plain after great Flood. They still remember Vitra and Vitruvian man. Monalisa is incarnation of “Mohini” swarup of Samudra manthan event. Rennaissance was nothing but revival of spirit of Samudramanthan (Churing of Ocean) for Holy Grail. Indra still rule world. America stand for Amarawati . Ancient capital of Indra near Mansorovar in Tibet. Sarswati river belt..was a place ,where Vedas were written. The river give us clue to Hastinga means (Haetumant) Saxons tribe that reached Britain. The Helmand valley region is mentioned by name in the Avesta (Fargard 1:13) as Haetumant, one of the early centers of the Zoroastrian faith, in pre-Islamic Afghan history. However, owing to the preponderance of non-Zoroastrians before the Islamization of AfghHanistan – particularly Hindus and Buddhists – the Helmand and Kabul regions were also known as “White India” in those days. Some Vedic scholars (e.g. Kochhar 1999) also believe the Helmand valley corresponds to the Sarswati area mentioned in the Rigveda as the homeland for the Indo –Aryan migrations into India, ca. 1500 BC. England, in Gàidhlig, is Sasainn (Saxony). Other examples are the welsh Saesneg (the English language),Irish Sasana (England), Bereton saoz(on) (English, saozneg “the English language”, Bro-saoz “England”), and Coernish Sowson (English people) and Sowsnek (English language), as in the famous My ny vynnav kows Sowsnek! (I will not speak English!). Following the downfall of Henry the Lion and the subsequent split of the Saxon tribal duchy into several territories, the name of the Saxon duchy was transferred to the lands of the Ascanian family. This led to the differentiation between Lower Saxony, lands settled by the Saxon tribe, and Upper Saxony, as the duchy (finally a kingdom). When the Upper was dropped from Upper Saxony, a different region had acquired the Saxon name, ultimately replacing the name’s original meaning. The Finns and Estonians have changed their usage of the term Saxony over the centuries to denote the whole country of Germany (Saksa and Saksanmaa respectively) and the Gemans (saksalaiset and sakslased, respectively) now. In old Finnish the word saksa meant merchant, as in the words voisaksa (Butter seller) and kauppasaksa (traveling salesman). In Estonian saks means a nobleman or, colloquially, a wealthy or powerful person. who migrated during the 13th century to southeastern Transsylvania. In the Celtic languages, the word for the English nationality is derived from the word Saxon. The most prominent example, often used in English, is the Gaidhlig loanword Sassenach (Saxon), often used disparagingly in Scotish / English / Scots. It derives from the Scotish Gaelic Sasunnach meaning, originally, “Saxon”, from the Latin “Saxones”; it was also formerly applied by High landers to (non-Gaelic-speaking) LOwlanders. As employed by Scots or Scotish -English-speakers today it is usually used in jest, as a (friendly) term of abuse. The Oxford English Dictionary (OED) gives 1771 as the date of the earliest written use of the word in English. The name of the Angles is first recorded in Latinized form, as Anglii, in the Germania of Tacitus. The name is usually derived from a toponym, Angelan, from a Germanic word “angus” meaning “narrow” (modern High German “eng”) or “angular” (of the shape of the Jutland peninsula). Gregory the Great in an epistle simplified the Latinized name Anglii to Angli, the latter form developing into the preferred form of the word. The country remained Anglia in Latin. King Alfred’s ( Alfred the Great) translation of Orosious’ history of the world uses Angelcynn (-kin) to describe England and the English people; Bede used Angelfolc (-folk); there are also such forms as Engel, Englan (the people), Englaland, and Englisc. NOW WE LATINISED FROM ANJALII…THAT ” AMJALI ” DON’T CONNRCTS ANLGO..INGVAONES WITH ANEGUNDI ? ANEGUNDI OF ANCIENT KISHKINDHA KINGDOM ? lINK TO ANGEVINS KINGDOM WILL EXPLAIN YOU EVERY THING. NOW we find that Ranjitsingh belong to Sansi tribe. He took control of Kohinnor first..and then gave the diamond to its original owner Britishers…Anglo….Angels..Lav nandan. That Sansi is Indian term for saxons. Link to Maharaja Ranjitsingh will explain you about his Sansi tribe. They carry tradition of ancient kingdom of Akkadians…who ever remained with Amorite tribes (Tribes of Amarawati).Tribe of Amrut Kumbh (Holly grail) traditions. Ptolemy in his Geography (2.10), half a century later, presents a somewhat more complex view. The Saxons are placed around the lower Elbe, which area they could have reached merely by an extension of the Saxon alliance. East of them are the Teutones and also a dissimilation of them, the Teutonoari, which denotes “men” (wer); i.e., “the Teuton men.” These Teutons or Teuton men appear to have been in Angeln and the land around it. According to him, the Ingvaeones were made up of Cimbri ,Teutrones and chauci. On the map of Ptolemy, the “Kimbroi” are placed on the northernmost part of the peninsula of Jutland., i.e. in the modern landscape of Himmerland south of Limfiorden (since Vendsyssel -Thy north of the fjord was at that time a group of islands). Himmerland (Old Danish Himbersysel) is generally thought to preserve their name, in an older form without Grimm’s Law . Alternatively, Latin C- represents an attempt to render the unfamiliar Proto-Germanic h = [? ], perhaps due to Celtic-speaking interpreters (a Celtic intermediary would also explain why Germanic *Þeuðan?z became Latin Teutones). The origin of the name Cimbri is unknown. One etymology is PIE *t?im-ro- “inhabitant”, from t?oi-m- “home” (> Eng. home), itself a derivation from t?ei- “live” (> Greek ???? ?, Latin sin? ); then, the Germanic *?imbra- finds an exact cognate in Slavic s?br? “farmer” (> Croatian, Serbian sebar, Russ. sjabër). Because of the similarity of the names, the Cimbri were at times associated with Cymru, the Welsh name for themselves. However, this word is regularly derived from Celtic *Kombrogi, meaning “compatriots”. Cumry is an evoluted form of the old welsh, with an assimilation of [b] to first [m], the second element brogi changed into bro “country” in Modern Welsh. It is hardly conceivable that the Romans would have recorded such a form as Cimbri The name has also been related to the word kimme meaning “rim”, i.e. the people of the coast. Finally, since Antiquity, the name has been related to that of the Cimmerians. The Teutons or Teutones were mentioned as a Germanic tribe by Greek and Roman authors, notably Strabo and Marcus ,Velleius ,Pateculus, and normally in close connection with the Cimbri, whose ethnicity is contested between Gauls and Germani. According to Ptolemy ‘s map, they lived in Jutland, which is in agreement with Pomponius Mela, who placed them in Scandanavia (Codanonia). Earlier than 100 BC, many of the Teutones, as well as the Cimbri, migrated south and west to the Danube valley, where they encountered the expanding Roman Republic. During the late 2nd century BC, the Teutones and Cimbri are recorded as passing west through Gaul and attacking Roman Italy. After decisive victories over the Romans at Noreia and Arausio, the Cimbri and Teutones divided forces and were then defeated separately by Gaius Marius in 102 BC and 101 BC, ending the Cimbrian war. The Teutones defeat was at the Battle of Aquae Sextiae (near present-day Aix –en – provence). 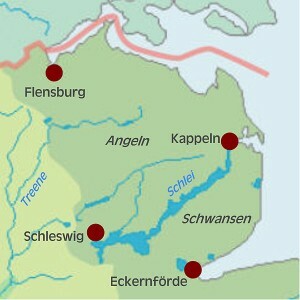 If the Teutons really came from the same quarter as the Cimbri, it is possible that their name may have been preserved in that of the district called until recently Thyland or Thythsyssel in the extreme north-west of Jutland. The Chauci lost their separate identity in the 3rd century when they merged with the Saxons, after which time they were considered to be Saxons. The circumstances of the merger are an unsettled issue of scholarly research. The Order of Brothers of the German House of Saint Mary in Jerusalem  (Official names: Latin: Ordo domus Sanctæ Mariæ Theutonicorum Hierosolymitanorum, German: Orden der Brüder vom Deutschen Haus St. Mariens in Jerusalem), commonly the Teutonic Order (Today: German Order = Deutscher Orden, also Deutschherrenorden or Deutschritterorden), is a German medieval military order, and in modern times a purely religious Catholic order. It was formed to aid Christians on their pilgrimages to the Holy Land and to establish hospitals. Its members have commonly been known as the Teutonic Knights, since they also served as a crusading military order in the Middle Ages. The military membership was always small, with volunteers and mercenaries augmenting the force as needed. After the Reformation, the Bailiwick of Utrecht of the Order became Protestant; this branch still consists of knights, but the modern Roman Catholic order consists Confederation from 1435 to 1561. After being defeated by Samogitians in the 1236 Battle of Schaulen (Saule), the remnants of the Livonian Brother of the sword were incorporated into the Teutonic Knights and became known as the Livonian Order in 1237. Between 1237 and 1290, the Livonian Order conquered all of Courland, Livonia, and Semigallia, but the Order’s attempts to invade the neighboring Novgord Republic were unsuccessful and its army was eventually defeated in the Battle of Rakvere (1268). In 1346, the Order bought the Duchy of Estonia from King Valdemar IV of Denmark. Life within the Order’s territory is described in the Chronicle of Balthasar ,Russow (Chronica der Provinz Lyfflandt). Above all facts talk about Ingvaones tribe. Ya Maharaja Ranjit singh belonged to Sansi tribe. The eaternal ally of Vengland tribe..Anglo. Now it is clear that Ranjitsingh knew original traditional owner of diamand Kohinoor. You read about Kohinoor History. The history will be connected automatically. Now a days Kohinnor becomes symbol of eaternal friendship between Anglo and Soxons. Lav nandan and Sansi..Saksyane. Link to Maharaja Ranjit singh. Link says that Ranjitsingh was from Sansi sikh tribe. Don’t doubt it. It is right History. Ranjitsingh (Saksyane- Indravanshi) and Lav nandan (Iscvone) both are eaternal friends. Indra was King of Amarawati when Ayodhya was founded By Manu Maharaj. Indra from Amarawati helped Manu for reinforcement to save dave sanskriti. Look European History bifercates Jutes…Saxons and Angels. Link to Anglo – saxons England. English History says story of Eaternal friend ship between Anglo -soxons. You read about History of kohinnor Diamond.In fact it belonged to Kaktiya dynasty of Rudramma…of Warangal…! Ranjitsingh traditional royal was knowing original owner of that diamomd. He was also aware about eatrenal friendship between Anglo -saxons. And Diamomd again reached to Rudramaa.There is not difference between wales and warangal dear. Link to Saxon King Vortigem….Dear Vitarahara forget? Link to King Vortigem of Britain. Read complete link to Saxons..
Chapter -2 still continue.The remaining part of the chapter will be posted soon. Thanks. This entry was posted in A Book - There was Ram. Bookmark the permalink.